My intention with painting, drawing, and sculpture is to depict the fullness of ordinary human life, in both its triumphs and trials, with honesty and candor. 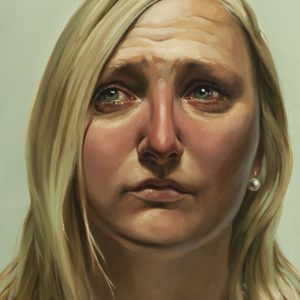 My current work depicts figures in moments of reflection on profound personal loss and grief. It is inevitable that we, as artists, will transfer images and experiences of our own lives into our work. In the last few of years I lost both of my parents --my father unexpectedly, and then my mother in an arduous battle with cancer. Through these life experiences, I feel compelled to portray figures honestly, exposing a stripped down version of the fragile nature of human emotion juxtaposed with enduring strength of character. This exploration of humanity, the vulnerability and psychology of the figure, are as interesting to me as are the features and anatomy of the human form. In the figure, we are confronted with the strain and tension of the anatomy, with the color of flesh, with body language and facial expression. In my work, I hope to achieve results that are very silent and very grand. These expressive elements are compelling, inspiring, sometimes disturbing and they have a unique power over us. They ask us to look beyond the figure portrayed and reflect on ourselves and our own experiences. This is ultimately why I am a figurative artist.